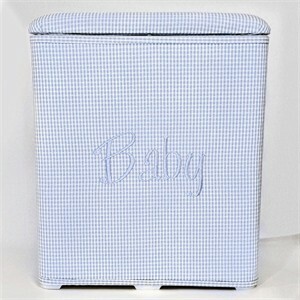 This Gingham Check Personalized Baby Hamper is a beautiful way to add charm and detail to your baby's nursery. A delightful design for a baby boy or girl, choose between blue, pink or green cotton, gingham check and personalize this hamper with baby's name at no additional charge! Personalize additionally with baby's initials or monogram. Keep the memory of your baby's first moments alive forever with this darling personalized baby hamper. Click here to view letter styles for one initial, two initials, three initials, monogram and script. Click HERE for thread color options. Availability: This Personalized Baby Hamper takes approximately 4 weeks to leave the warehouse plus transit time.